It is finished...no, not the craft room...the back of the baby cardigan. (Working cables is SO much more satisfying than seed stitch.) It just didn't feel right to spend yesterday cleaning. Yesterday was Anniversary Day...21 years of togetherness. Hmmm, our marriage is 21 years old...does that make it "legal age"? I suppose we should have toasted to it, but not us. 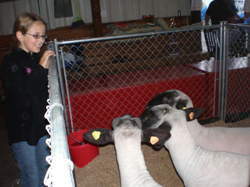 Instead of dinner at a fancy restaurant, we ate our way through the County Fair. An evening together with the kids (our greatest "accomplishments"). It seemed fitting: family and comfort food (with a few horse apples along the way- sounds like a good marriage. 21 years has no special gift; it's somewhere between platinum/china (20) and silver (25). Hmmmm, 7th is the "wool" anniversary and 21 is divisible by 7. That makes 21 three times the wool. Sounds about right. Two more postcards have arrived on our doorstep! 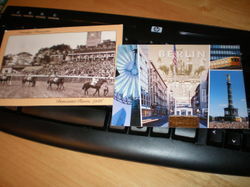 This time Nikki sent one from Doncaster, England and Anne (who lives in Belgium) mailed one from Berlin!! Thank you both!! 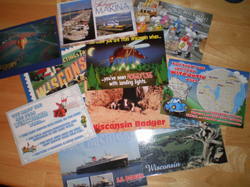 Since this week is my vacation, their postcards reminded me of how much fun it is to mail postcards while on vacation. Speaking of postcards...how about business card sized Project Info Cards!?! Totally cool. 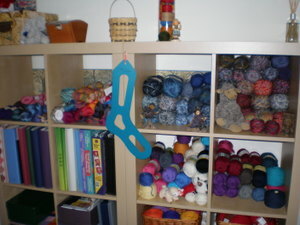 (Though after the "yarnventory" at Chez Krafty1: temporarily impractical.) That's the extent of this week's Web Wednesday links. (Hey, I really AM on vacation!) Oh all right....and finally...your goofy photo of the week. The shelves are up and the yarn is being sorted, photographed, uploaded to my Ravelry stash inventory, and placed on the shelves. The third drawer (solid colored sock yarn) has finally been emptied! It alone caused my Ravelry stash to swell from 55 to 87 yarns stashed. 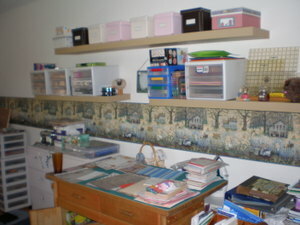 But, yarn is not the only thing getting a new home this week; all of the scrapbooking/cardmaking/sewing/quilting/misc. crafting is getting attention as well. The scrapbooks and photos and papers and rubberstamps and ink pads and adhesives and fabric and Sculpey and beads and OMIGOSH!!! The current "crown jewel" is that there are actually clothes hanging in the closet for the first time in six years! Look at this "before" photo. All of the containers of yarn/fabric/thread/miscellany are outta there. Clothing...in a closet!...imagine that!!!! Ever watch Frazier? He always started his radio show with "I'm listening." Me too. I'm listening. I resisted temptation and DIDN'T purchase the Tulip baby cardigan at Stitches. Friday seemed like the perfect day to start the Dale baby cardigan. No needle. 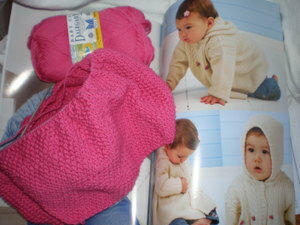 Saturday, I made the trip to Fond du Lac to get either a needle or a tulip cardigan kit. No tulip kit. BUT, they did have a 24" 2.25mm. It was INOX, but it was time to start "listening". No more looking around at other patterns. Someone's trying to tell me something and I'm listening. Once finished, my stash will be six skeins lighter. I'm listening. We'll talk about the "stash load" tomorrow. Let's just say cleaning the craft room and entering info onto Ravelry has encouraged "lightening then stash load". I'm listening. Have you listened to the latest Cast-On podcast? Brenda introduces another phase in the "summer of scouting". True to Scouting, there are beads and badges. Thus, the inspiration for my upcoming vacation. Last month, I discovered that there were 5 vacation days in my possession that needed to be taken before Sept. 10th or they'd disappear into the ether. Not the type to let a good thing slip between my fingers, and after a bit of internal debate as to scheduling before or after school starts for the kids, the dates were set for next week. Doogie will be working. Panda has x-country practice and work. So Special K has taken to calling next week "Camp Mom". (This week was "Camp Grandma".) And that's where Brenda provided inspiration. Next week, Camp Mom will be working on beads and badges. 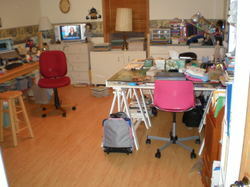 Time to transform the craft room/studio/office from its current state of chaos. 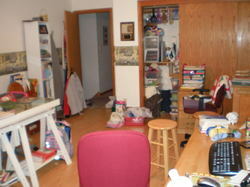 Chaos that extends from one end of the room to the other! School starts in a week...the girls need their homework spaces put back together...our crafting "stuff" is all over the place and needs to be organized. Stay tuned. 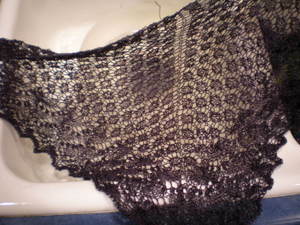 The blocking wires made blocking this lace SO easy. It took very little time to get it all laid out on the bed. 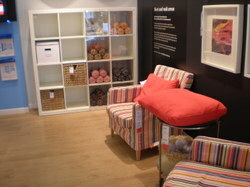 (Beds really DO make great blocking boards!) Despite Wisconsin's current HIGH levels of humidity, the entire thing was dry by this afternoon. 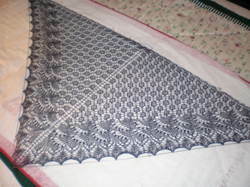 I'm so pleased with how this one turned out that it has been extremely difficult to resist the temptation to cast on another lace project! 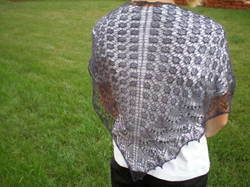 I finished the Swallowtail Shawl yesterday. 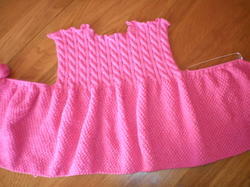 Here it is as it jumps into its "christening" bath; then onto the blocking wires for drying. Hopefully it won't take too long to dry (despite the intense "dampness" in WI at the moment!). Robin asked about Doogie's purchases from Stitches. 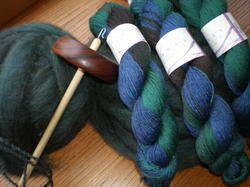 He bought 6 ounces of "Jacob" roving and a drop spindle from Handspun by Stephania. Steph's husband, Jim, was an incredible teacher in drop spindle technique. Doogie's been playing with his spindle in hopes of producing enough "decent" yarn to make a hat for himself. 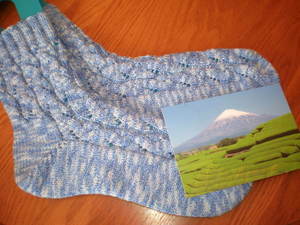 He purchased some Lorna's Laces Black Watch sock yarn to make kilt hose. (And, yes, he has the kilt to go with the socks!) Doogie felt that someone in the house should purchase sock yarn!